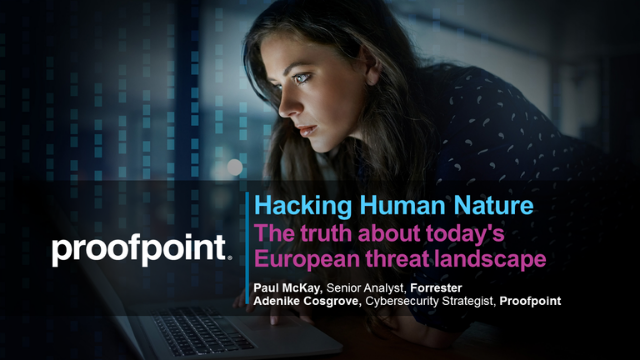 Join Paul MacKay, Senior Analyst at Forrester, and Nikki Cosgrove, Cybersecurity Strategist at Proofpoint, as they discuss the latest European cybersecurity trends and what you can do to guard against them. 53% of European companies have reported experiencing a data breach in the last 12 months. Companies are increasingly using cloud applications, making it easier for hackers to obtain credentials, and with email remaining the most common attack vector (over 90% of worldwide cyberattacks start with an email), it’s vital that organisations defend not just their networks, but their employees too. 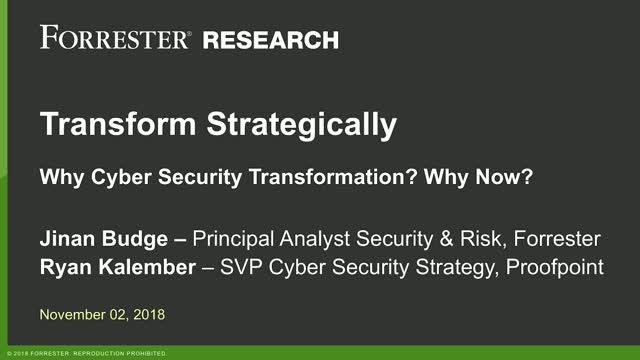 This webinar focuses on both Forrester European cyberattack landscape research and Proofpoint’s own threat insights. Discover what’s needed to build a cybersecurity strategy that will protect your most valuable asset- your people. 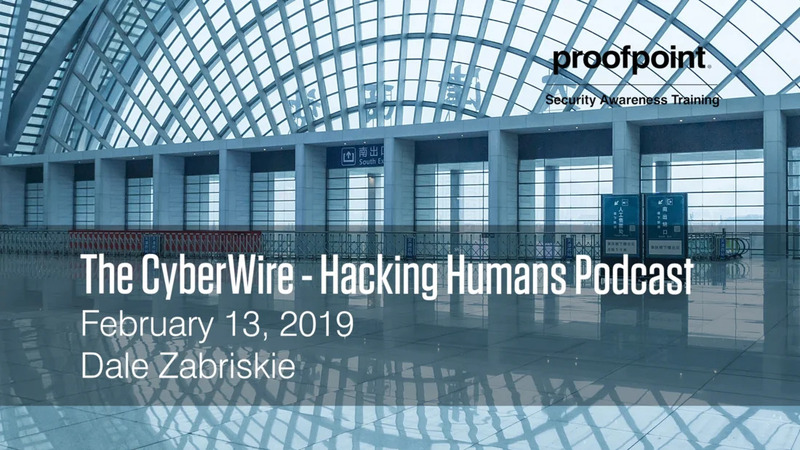 The CyberWire’s Hacking Humans Podcast interviewed Dale Zabriskie, our Security Awareness and Training Evangelist, who shared some surprising insights from the 2019 State of the Phish Report. Fill out the form to watch the webinar replay now. Kicking the security awareness bucket down the road? Planning for 2019? Your people are the most important aspect of security – don’t leave them unprepared when they come face to face with cyberattacks. Grab your popcorn and watch a 30-minute demo of our award-winning phishing simulations and security awareness training. We’ll give you an overview of our products and show how they work together to deliver up to a 90% reduction in successful phishing attacks and malware infections: ThreatSim® Phishing Simulations CyberStrength® Knowledge Assessments 35+ Interactive Training Modules PhishAlarm® Email Reporting Button and PhishAlarm® Analyzer Email Prioritization Tool Security Awareness Materials and Videos Fill out the form now to try our products for a hands-on experience. We surveyed more than 6,000 working adults across the US, UK, France, Germany, Italy, and Australia —about cybersecurity topics and best practices that are fundamental to data and network security. What we found out about the personal habits of these individuals was sometimes heartening, occasionally perplexing, and frequently terrifying—but always enlightening. 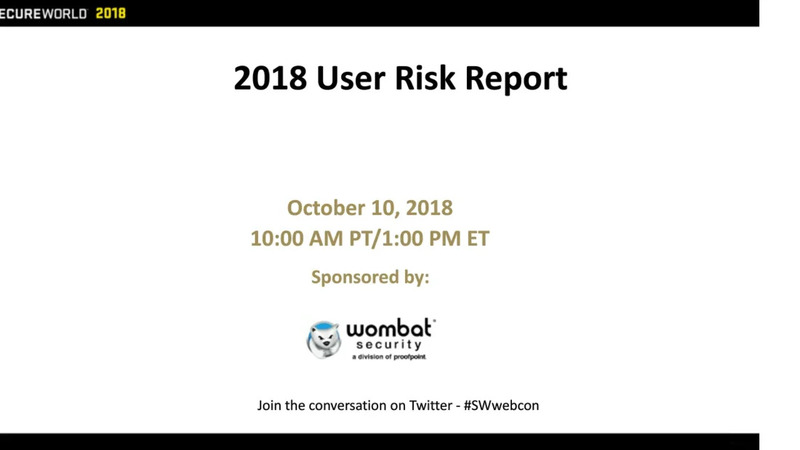 We will discuss the 2018 User Risk Report to see how employees shaped up globally and regionally on cybersecurity awareness issues that are impacting organizations worldwide, including: Knowledge of phishing and ransomware Password habits (including password reuse) Safe use of WiFi, location tracking, and social media The types of personal activities (shopping online, playing games, streaming media, etc.) that your organization's devices are being used for by employees and their families and friends Fill out the form to watch the webinar replay now. Phishing continues to be one of the fastest growing and most malicious threats to security of industries of every kind—from financial organizations to government contractors to healthcare firms. Today’s savvy phisher manages to evade even the most sophisticated safeguards through carefully planned, socially-engineered email phishing attacks that are only getting more advanced. In this webinar, we will review the key findings and insights from our 2018 State of the Phish Report: Aggregation and analysis of data from tens of millions of simulated phishing attacks sent through Proofpoint Security Awareness Training over a 12-month period Analysis of more than 10,000 responses from quarterly surveys of infosec professionals from more than 16 industries, as well as data from an international survey of working adults who were queried about social engineering threats and their cybersecurity behaviors Insights into current vulnerabilities, industry-specific phishing metrics, and emerging threats Panelist: Gretel Egan – Brand Communications Manager, Proofpoint Security Awareness Training Fill out the form to watch the webinar reply now. 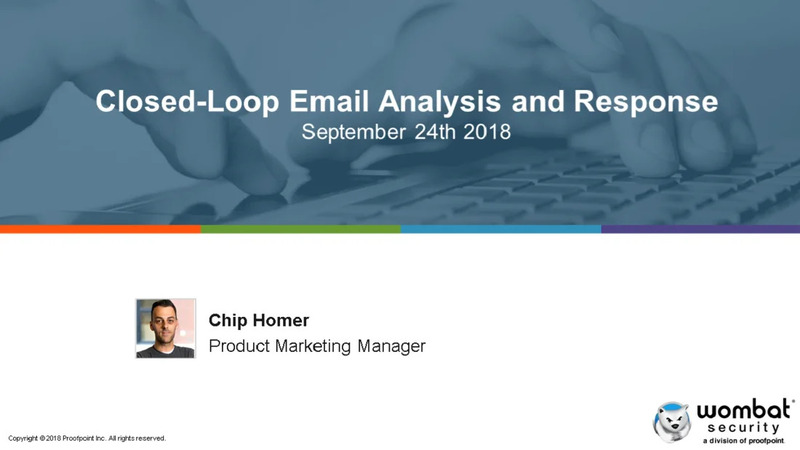 Proofpoint's Closed-Loop Email Analysis and Response (CLEAR) solution, is a complete closed-loop approach to instant end user email reporting, analysis, and remediation to stop potentially malicious emails that pass through perimeter defenses. Once reported, CLEAR automatically analyzes messages against multiple intelligence and reputation systems, reducing an organization’s typical threat triage time from days to minutes without requiring additional work from human analysts. 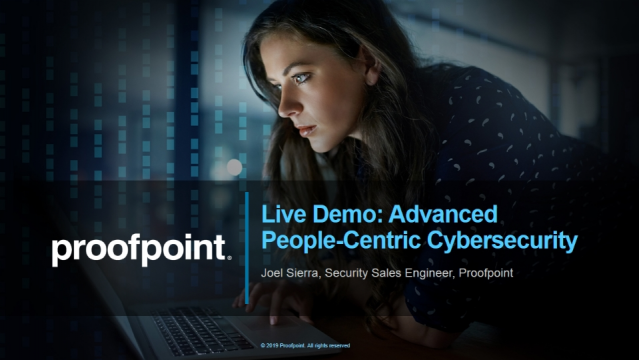 Proofpoint CLEAR is the first joint solution using Proofpoint Security Awareness Training’s powerful end-user solutions post-acquiring them earlier this year. 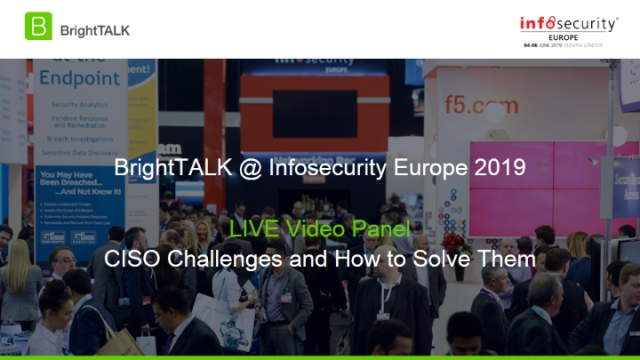 Panelists: Chip Homer – Product Marketing Manager, Proofpoint Security Awareness Training Mark Wuslich– Product Manager, Proofpoint Security Awareness Training Fill out the form to watch the webinar replay now. As a security professional, we know that your time is valuable. At Proofpoint Security Awareness Training, we’ve built some great automation tools directly into our Security Education Platform to help you run an effective security awareness program with minimal setup time. In this webinar, you’ll learn how unique features like auto-enrollment and follow up campaigns can streamline the administrative process while giving your end users a whole quarter of great content. 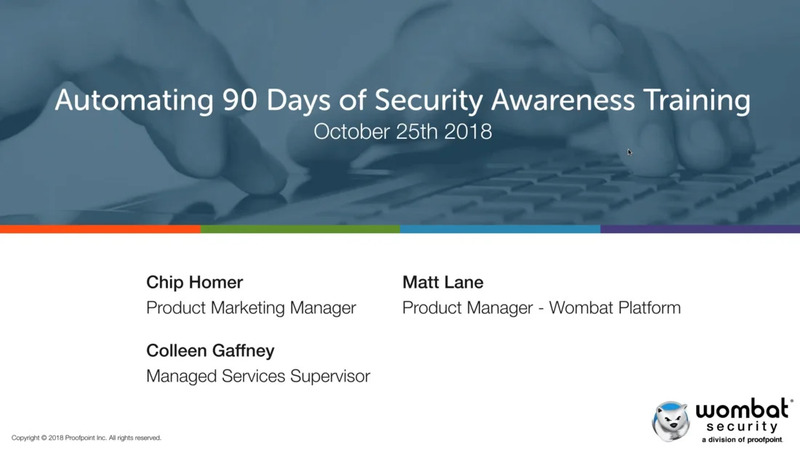 Panelists: Chip Homer – Product Marketing Manager, Proofpoint Security Awareness Training Colleen Gaffney – Managed Services Supervisor, Proofpoint Security Awareness Training Matt Lane – Product Manager, Proofpoint Security Awareness Training Fill out the form and watch the webinar replay now. Insider data leaks, whether malicious or accidental, can be caused by anyone: the extra-helpful customer service rep, the highly privileged IT admin or the jet-setting CFO. How do you detect and mitigate insider data leaks and reduce the potential for such incidents in the first place? In this webinar, learn how cybersecurity professionals can address the insider threat without shutting down business. Attend this webinar and you’ll learn: What essentials must be in your end user awareness program and how to make those lessons stick Which tools and techniques can be used to enforce security policies when your users unintentionally or maliciously try to break them How you can spot the signs of an impending or ongoing insider data leak and respond Panelists: Katie Burnell – Global Insider Threat Specialist, Dtex Systems Kurt Wescoe – Chief Architect, Proofpoint Security Awareness Training Sara Peters – Senior Editor, Dark Reading Fill out the form to watch the webinar reply now. You’ve gone over social engineering scenarios with your end-users. You run quarterly phishing simulations. You use gamification and fun videos to help create a culture of security awareness within your organization. You even have internal champions within the different business units. So why is it that Paul in Accounting got hit with a ransomware attack last week? Why are the sales people continuing to fall for phishing emails? And seriously, why can’t the executives follow the same rules as the rest of the employees? 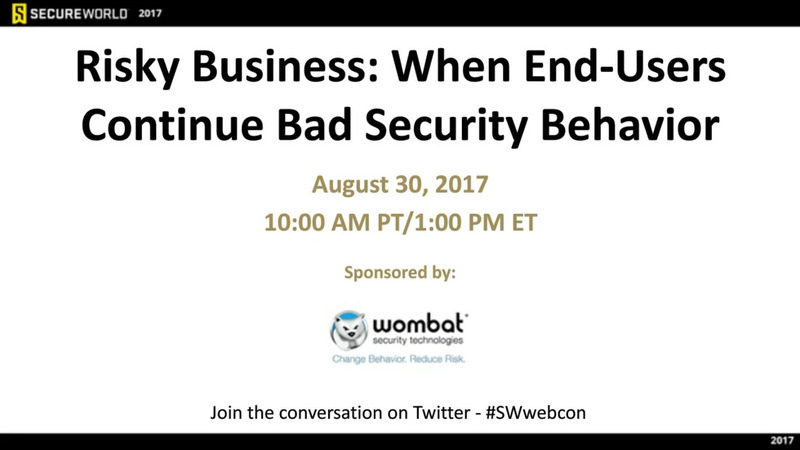 Join this web conference as our expert panelists discuss how to deal with risky behavior from your end-users. When should you escalate this to HR or higher ups? Do extreme cases call for termination of employment? *CPE credit is available. Speakers: Mitchell Sprinsky, CIO - Spectrum Pharmaceuticals Alan Levine, Cybersecurity Advisor - Proofpoint Security Awareness Training Mike Muscatel, Information Security Manager - Snyder's-Lance, Inc. Moderated by: Sam Masiello, CISO- Teletech Key Topics Include: How to deal with risky behavior from your end-users Whether or not to pursue an escalation path for repeat offenders Download now to learn more. This is a joint presentation of Proofpoint Security Awareness Training and SecureWorld. *Viewing this webinar may be used to earn CPE credit hours, for more information please contact Tom Bechtold at SecureWorld via email at tomb@secureworldexpo.com. Whether budgets are robust or restrictive, infosec teams are often skeptical about diverting dollars away from technical tools so they can better fund awareness training. Fortune 500 CISO Alan Levine felt the same — until a nation-state attack on his organization led him to reexamine employees’ roles in cybersecurity and the value of defense-in-depth strategies at users’ desktops. 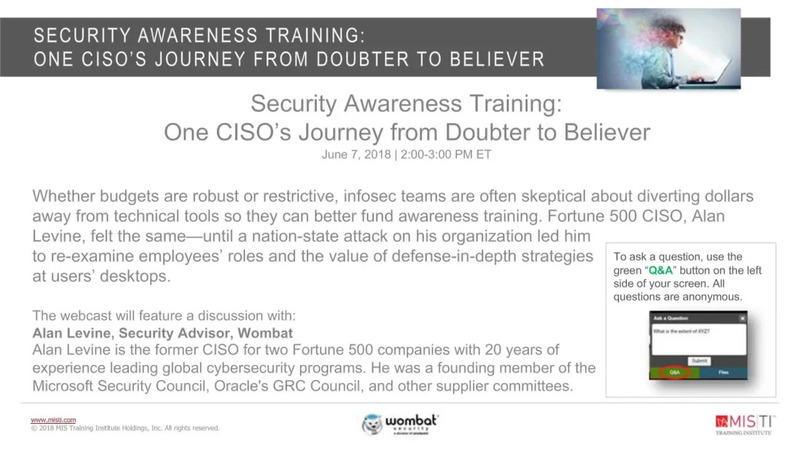 Watch this webinar replay to learn about Levine’s journey from security awareness training skeptic to advocate. Panelist: Alan Levine – Security Advisor, Proofpoint Security Awareness Training. Fill out the form to watch the webinar reply now. Phishing has long been a headline threat for infosec teams — but email is just one entry point for cybercriminals. 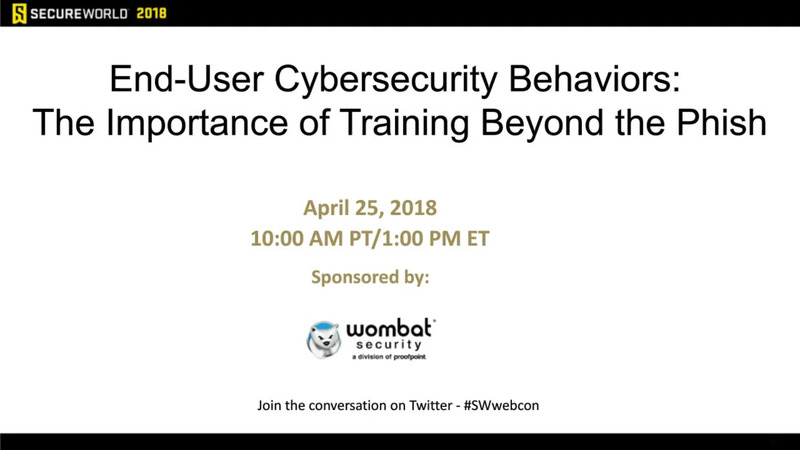 Webinar attendees will learn why it’s important to assess and train their end users about cybersecurity threats beyond email-based social engineering. During this session, we will share results from the Proofpoint Security Awareness Training 2018 Beyond the Phish® Report, which analyzes data from nearly 85 million responses to cybersecurity knowledge assessments and training challenges presented to global end users across multiple industries during 2017. We will discuss end users’ strengths and weaknesses across 12 cybersecurity topics — from identifying social engineering scams to protecting confidential information to working safely outside the office. We’ll also highlight variations in end-user knowledge levels across industries, giving you a benchmark against which to compare your organization’s readiness. Attendees will also see how data insights from knowledge assessments and training activities differ from those related to simulated phishing attacks, and how using these tools together can give a more complete view of susceptibility. Finally, we’ll provide guidance about how to use this information to strengthen your end users and reduce the risk of successful cyberattacks within your organization. Join our experts as we dive into the report and share best practices and pitfalls as we try to create a culture of security within our organizations and community. Featured Presenters & Moderator: Amy Baker, VP Marketing, Proofpoint Security Awareness Training Victoria L. Thomas, Cybersecurity Awareness Leader, Fortune 500 Company Mitch Parker, Executive Director InfoSec & Compliance, Indiana University Health James McQuiggan, Product & Solution Security Officer, Siemens Gamesa (moderator) Fill out the form to watch the webinar reply now. Phishing remains the top attack vector used by cybercriminals, and every end user is a potential target. But with the right security awareness training, these same people can be transformed into a key component in your anti-phishing defense. Kurt Wescoe, Chief Architect of Proofpoint Security Awareness Training, shares his insights and perspectives in this interview hosted by BankInfoSecurity. 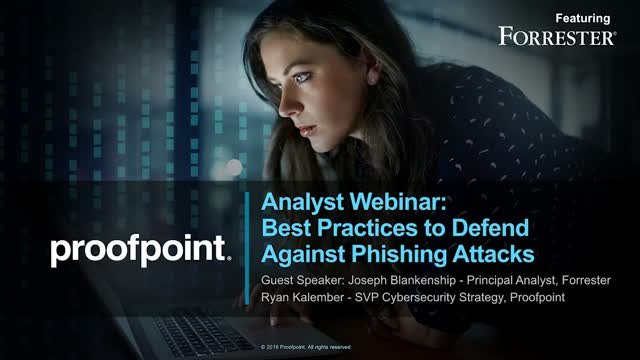 Listen to the interview to learn more about: Current phishing trends What’s wrong with traditional end-user training How Proofpoint takes a different approach to security awareness training Panelist: Kurt Wescoe – Chief Architect, Proofpoint Security Awareness Training Fill out the form to watch the webinar reply now. The healthcare industry faces increased attacks from cybercriminals, and risky end-user behaviors are only exacerbating the threat. A new report from Proofpoint Security Awareness Training, State of Security Education: Healthcare, helps organizations understand the knowledge gaps that affect their security postures and increase risk. Join us for a deep-dive webinar that explores end-user data specific to the healthcare industry. We will analyze responses gathered via nearly 85 million questions asked and answered in our Security Education Platform, as well as data culled from tens of millions of simulated phishing attacks. During this webinar, you’ll learn: How end users in the healthcare space perform on 12 important cybersecurity topics How healthcare organizations use security awareness training to mitigate risk How a regional hospital reduced phishing susceptibility by 86% Panelist: Amy Baker – Vice President of Marketing, Proofpoint Security Awareness Training Fill out the form to watch the webinar reply now. Proofpoint Email Fraud Defense (EFD) can help you protect your organization and your customers, leveraging the power of email authentication. Join us for our EFD demo, one in a series covering our Email Protection Solution. 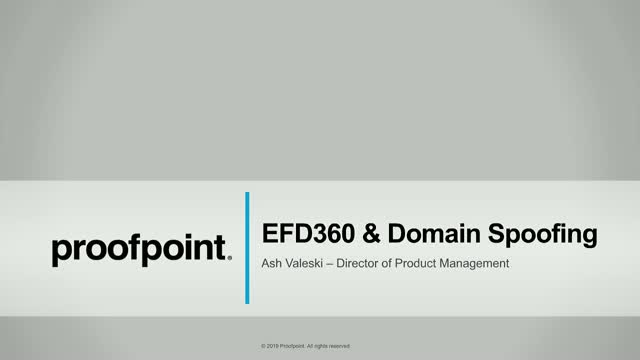 Learn how EFD can help you: Block malicious emails spoofing your domains before they reach your employees and customers Monitor all emails (inbound and outbound) from your domains and those of third parties Accurately distinguish between legitimate emails and fraudulent emails About the presenter: Alex Fryback, Product Manager at Proofpoint. Today’s most popular security and compliance tools focus on protecting the perimeter—they manage endpoints and patch system vulnerabilities. But cybercriminals don’t target technical vulnerabilities. They target human weakness: the distracted user who clicks on an email attachment, the eager customer who fills in credentials to claim a fake offer, a loyal employee who follows directions to wire money from a criminal impersonating their CEO. The only security strategy that will successfully combat today’s advanced attacks is one that focuses on protecting our people. Join Proofpoint SVP Ryan Kalember to learn how to build a strategy that: Reveals who is targeted Combats attacks before they reach your users Mitigates damage from the attacks that will inevitably reach your people About the presenter: with over 15-years of experience in the information security industry, Ryan currently leads cybersecurity strategy for Proofpoint and is a sought-out expert for media commentary on breaches and best practices for enterprises as well as consumers. Download this on-demand webinar to learn more about the latest with Proofpoint Enterprise Archive's offerings for Financial Services organizations. You May Also Like: Analyst Report: Protecting Against Advanced Threats and Compliance Risks White Paper: What You Don’t See Could Be Hurting Your Organization Video: Why Proofpoint? Across organizations, Office 365 is accelerating the digital transformation. This transformation also includes many other popular SaaS applications. This means new ways of communication and collaboration. As employees feel empowered to achieve more, what new considerations does this means for you to ensure security, protect data, and mitigate compliance risk? Watch this webinar to learn: Hear about new types of risk this transformation introduces to your people and data. Learn about the evolution of compliance requirements in the modern workplace. Identify steps and effective countermeasures to protect your people, data, and brand in Office 365, G Suite, and more. As you plan the big move to the cloud with Office 365, you’ll want to understand the Office 365 security implications, especially when it comes to protection, compliance, and email continuity. Fill out the form to view our webinar and learn: How to plan for a successful migration to Office 365 How you can protect your Office 365 from advanced threats and targeted attacks How to avoid the hidden costs for IT and compliance staff You May Also Like: White Paper: The risks of moving to Microsoft Office 365 Anaylst Report: Deploying and Managing Security in the Cloud Infographic: Is Microsoft Office 365 Secure? Apps are sending your data all over the world. How can you defend against this? Download this on-demand webinar and delve into how to meet your archiving, eDiscovery, and compliance needs with Office 365. You May Also Like: White Paper: The risks of moving to Microsoft Office 365 Anaylst Report: Deploying and Managing Security in the Cloud Infographic: Is Microsoft Office 365 Secure? Download this on-demand webinar to learn key points to consider when looking at Office 365, including what stakeholders to engage, buying criteria, and areas that may require 3rd party support. You May Also Like: White Paper: The risks of moving to Microsoft Office 365 Anaylst Report: Deploying and Managing Security in the Cloud Infographic: Is Microsoft Office 365 Secure? 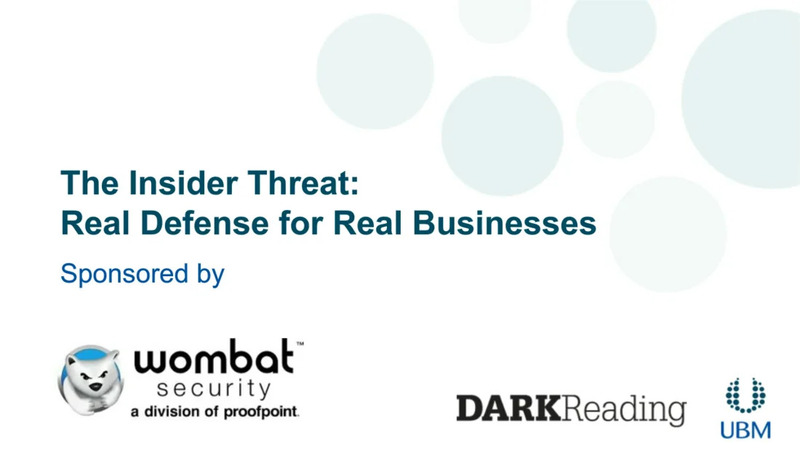 Download this on-demand webinar to listen in as Proofpoint's Joe Diamond speaks with guest speaker Mike Osterman, CEO and Founder of Osterman Research, about his recent research into the top challenges IT and Information Security professionals face today, what they expect to see in 2015, and how they are tackling these challenges. You May Also Like: Data Sheets: Proofpoint Encryption Webinar: Prevent a Data Breach - Stay Out of the Headlines & Save Money Through Encryption Infographic: Is Microsoft Office 365 Secure? Download the on-demand webinar for a discussion on the top questions revolving around Office 365, complex security requirements, and protection from advanced email security threats. You May Also Like: White Paper: The risks of moving to Microsoft Office 365 Anaylst Report: Deploying and Managing Security in the Cloud Infographic: Is Microsoft Office 365 Secure? 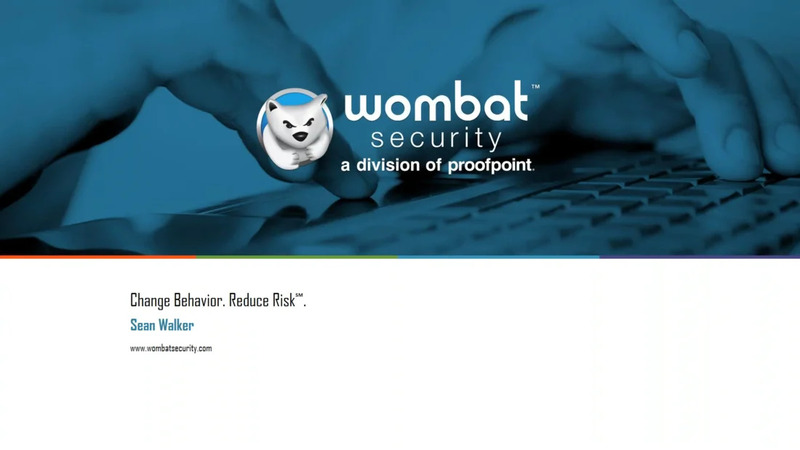 Download this highly recommended on-demand webinar to learn more about phishing and watering holes, the controversy with watering holes as the "phisher's toolkit," and a demo of Threat Response and how it plays into the larger Proofpoint security suite. You May ALso Like: Analyst Report: Protecting Against Advanced Threats and Compliance Risks White Paper: What You Don’t See Could Be Hurting Your Organization Video: Why Proofpoint? Enterprise Social Media Risk and Regulatory Compliance in 2015: Are You in Control?